I have been two bags to show you tonight. Both were made as gifts and I am entering them into the Purse Palooza competition. 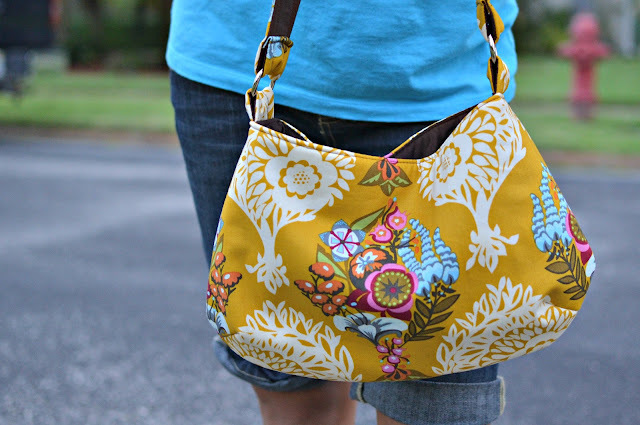 You can check out the flickr group for some lovely purse inspiration. The first one is a mini-messenger. It is a remake of one I made a long time ago for a friend who loved it. It is a remake of one I made a long time ago for a dear friend who loved it. The red one was bought by a mom whose kids go to the same school as mine. I watched her walk in and out of school with it every day and I couldn't keep my eyes off it. I seriously love this style. I think it's the addition of the rings that really make it great. I made this one for another gal and I kind of wish I could have kept it. I have a gray and orange version I am dreaming up in my head for myself. Hope to sew that soon. I'm off on to vacation in GA tomorrow. We will be gone for a few weeks so posting may be spotty. I'm going to try blogging with my Ipad again while I'm gone. I've heard Blogsy works good as an app. Has anyone had any success using that?? I guess you will see. Don't be surprised if post are a little crazy looking. I love your bags particular the yellow one!Thanks for sharing.